The Acting School focus over on the LAMB this month is Jeff Goldblum, and the Director’s Chair feature is dedicated to David Cronenberg, so this was too good of an opportunity to pass up. I’ve seen The Fly before – only this version, I’ve never seen the 1958 original – but it’s been a long time and all I could really recall was how gross it gets towards the end. What I’d completely forgotten about was just how fantastic Goldblum is here, as well as the incredible practical effects. 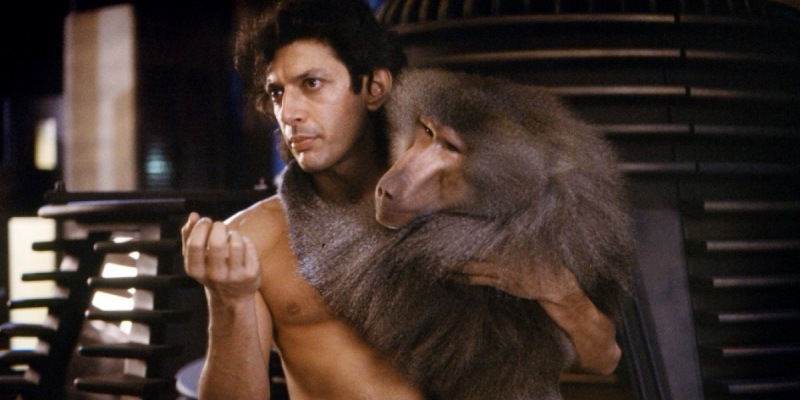 Seriously, Goldblum is amazing. It should go without saying that the Goldblum performance I am most familiar with – as is presumably the case with most people – is Dr. Ian Malcolm in a little film I like to call Jurassic Park, but seven years earlier Goldblum laid a template with what may be his career-best work (although to be fair there are still a lot of his films that I haven’t seen). 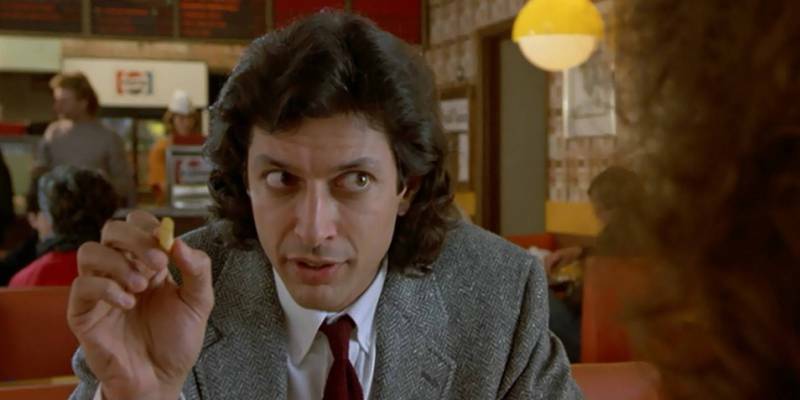 The real-life persona of Goldblum is one of charming eccentricity, a uniquely paced speech pattern matched with a devilish eye twinkle and restless, flourishing hands, and his best roles draw heavily from his own personal idiosyncrasies. Take Seth Brundle, for example. We meet him at a party, where he is already mid-flow in conversation with Veronica, and it’s not long before he invites her back to his place to see his new invention, along with his high-tech cappuccino maker. Brundle is equal parts bookish nerd and stage magician, eager man-child and confident entrepreneur, and you completely understand why Ronnie, this beautiful, dedicated reporter, eventually falls for Brundle, regardless of how atypical he seems. Goldblum’s quirky and tic-filled approach to acting is perfect for Brundle, and becomes even more so as the film progresses and he takes on some less human qualities. You see, during his inaugural drunken teleport, Seth inadvertently teleports himself and an additional rogue element, a common housefly, causing their respective DNA codes to become gradually spliced together. I left that out of the initial plot summary because it felt like a spoiler, however given the film is called The Fly and what I mentioned is both the inciting incident and spelled out very clearly as the film progresses then I think it’s OK. And I’m going to ignore the fact that Brundle’s body is also teeming with many, many other living organisms in the forms of bacteria, because frankly I didn’t want to see him transform into this giant amorphous blob. 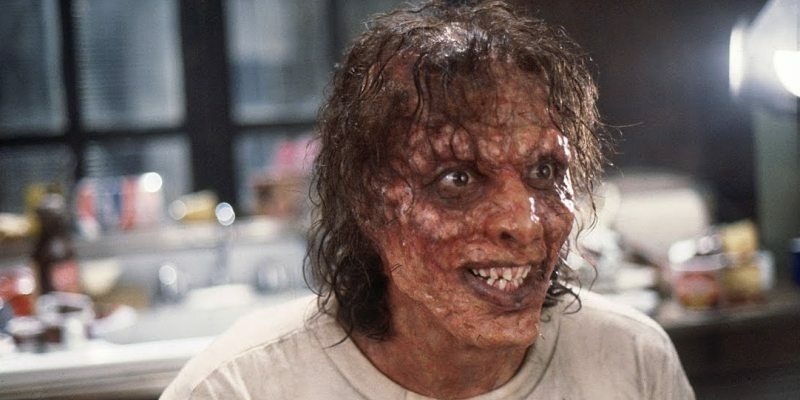 So, as the Brundle-Fly creation becomes increasingly fly-like it allows Goldblum to fully embrace his restless, nervous, twitchy side, whilst also maintaining, if not in fact accentuating, his confidence and wonder at what he is now capable of. 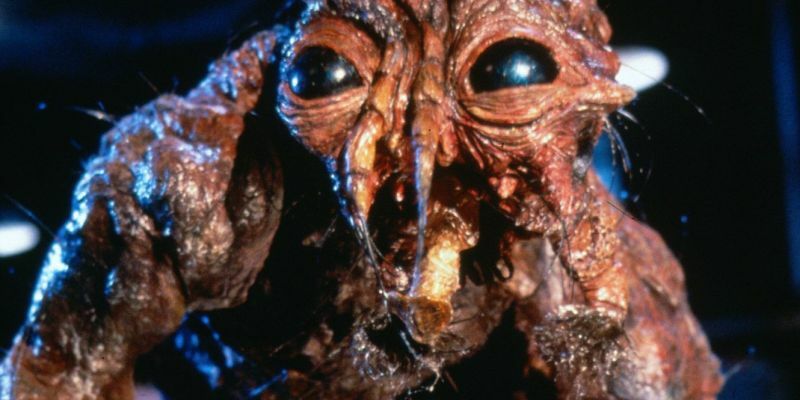 That’s something I love about The Fly: where other films would have the lead immediately terrified of what they are becoming and the seemingly irreversible effects of the experiment, Brundle is at heart a scientist, and therefore visibly excited by this discovery and the possibilities it may hold. Regardless of how far Brundle goes in this search for progress, we stay on his side almost all the way, such is the charisma of the performance and the empathy we feel, having followed him for much of his journey. 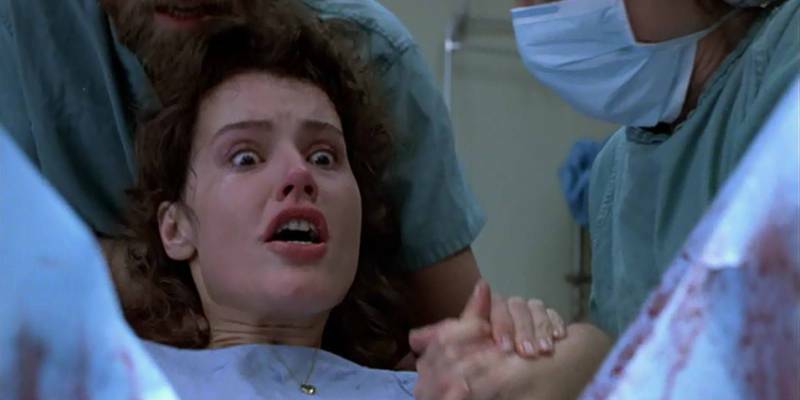 Geena Davis is also very good as Ronnie, elevating what could be a thankless love interest role into something more, as she deals with not only Brundle’s transformation, but also her possessive, boundary-ignoring ex-boyfriend and boss Stathis (John Getz). These three actors make up the core focus of the film, with a few ancillary characters dotted around, so given the limited cast and meagre selection of filming locations – it’s almost entirely set in Brundle’s lab, with a couple of excursions to Ronnie’s workplace, a hospital and a couple of drinking establishments – The Fly feels a lot like a stage play, although with vastly superior special effects. That’s the film’s key other draw. The make-up, which rightfully earned Chris Walas and Stephan Dupuis an Oscar for their troubles – is incredible. Yes, at times Goldblum is clearly wearing a padded suit to allow the extra layer of grotesqueness to cover his entire body, but for the mid 80s this cannot be faulted. Director David Cronenberg rarely shies away from horrifically gory sequences, and here he outright embraces them, as we see pieces of Brundle literally falling off or secreting fluids that should not be emanating from where they are. The sequence where he demonstrates how he now has to eat is nothing short of nauseating, and the dream sequence towards the end is easily the closest the film veers to the horror territory. The Fly is great. If you can’t stomach sick scenes then you should probably skip it, but if you’re fine with them then this is a must-watch. Amazing performances, stellar effects, a tight, streamlined plot that’s under 90 minutes long and rarely shows anything not utterly essential – as I mentioned earlier, the film starts mid-conversation between the leads, whereas usually you’d at least see, for example, Ronnie walking into the scientist conference, or Brundle building up the courage to go and talk to her – all add up to a fantastic, and very very gross, experience. This entry was posted in 09/10, 1001, 5-Star 500, Choose Film, Empire 100, Neill Blomkamp, Review, The List and tagged David Cronenberg, Geena Davis, Jeff Goldblum, John Getz, The Fly by jaycluitt. Bookmark the permalink. This is one of my all-time favorite performances. What Goldblum accomplishes here is nothing short of amazing. And that make up…you were so right in praising it and even excusing it’s very minor flaws as products of the time. Great review. Thanks Dell, I’m glad you enjoyed it and this is very worthy of being considered one of your favourite performances, Goldblum is phenomenal.